Sweden, USA, China or Europe – you can find your Russia in almost every corner of the world. Here are some typical Russian landscapes found in the most unusual places outside the country. 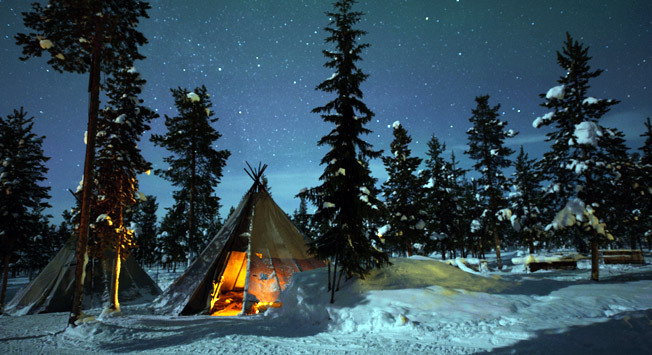 The tents of reindeer herders in Sweden resemble the chumi of indigenous tribes in the north of Russia. Both belong to Saami people, whose homeland includes northern Norway, Sweden, Finland and the Russian part of the Kola Peninsula. According to the 2010 census, 1,771 people identifying themselves as Saami live in Russia. There are nine different Saami languages, all of which are ranged by UNESCO from “definitely endangered” to even “extinct”. The way of life and the economy of the Russian Saami are based upon reindeer herding, fishing, mammal hunting and trapping. The capital of ‘Russian Lapland’, where most Saami live, is called Lovozero (Lujávri). It is situated to the north of the Arctic Circle on the shore of a great lake of the same name. The Orthodox Cathedral (Nuestra Senora de Kazan) in La Habana, Cuba , bears a striking resemblance to the Russian churches of the cities of the Golden Ring, one of Russia’s main tourist destinations. The route passes through medieval Russian cities with numerous monuments to the culture and history of old Slavonic Rus. It includes 11 cities located within easy reach of Moscow. A trip around the Golden Ring is a great way to get a better sense of the culture and history of ancient Russia. The occupation of East Berlin by Soviet forces resulted in the construction of many buildings in this part of the city that resemble khrushchevki - low-cost, paneled apartment buildings which were developed in the USSR during the early 1960s, when their namesake Nikita Khrushchev headed the Soviet government. In Russia you can see khrushchevki in the suburbs of almost every town, from Moscow to Vladivostok. They were originally considered to be temporary housing until the housing shortage could be alleviated, but many people continue to live in Khrushchevki today. Knez Mihajlova, the main street of Belgrade, has a sibling in Russia – Muscovite Kamergersky Lane, in the very heart of the city. These two streets could easily be mistaken for each other. Almost every building on Kamergersky is considered to be a Moscow landmark, but perhaps the most important building on the street is the Moscow Art Theater, founded by Konstantin Stanislavsky and Vladimir Nemirovich-Danchenko. This theater became the birthplace of the Stanislavsky Method, the actor’s world-famous system for training actors, hugely influential in the acting world and in the development of modern American theater. These buildings along the canal in Shanghai are likely to be found not only in Russia and China. For example, more than half of RBTH editors own (or, more probably, rent) apartments in buildings like these. “Oh, it looks like my neighborhood in Vorobyovy Gory” was the comment of our Executive Producer for Asia, who happened to see the photo while passing. The National Congress Building in Brasilia could easily fit into the architectural ensemble of Yekaterinburg. Only two cities in the world can compete with Yekaterinburg in terms of the concentration of 20th-century architectural monuments. The World Heritage Site UNESCO names Yekaterinburg an architectural monument to Constructivism, a unique style that was born in the Soviet Union. The city has one of the largest numbers (140) of buildings built in the Constructivist style in the world. Also, it is the only city in the world with constructivist block housing. Rundale Palace in Latvia is the younger brother of Peterhof Palace, and both were built by Russian-Italian architect Bartolomeo Rastrelli in the middle of the 18th century. Peterhof, the "Russian Versailles", is situated not far from St. Petersburg. In the 18th and 19th centuries it was the summer residence of the Russian tsars and its palace ensemble is listed among the UNESCO World Heritage Sites. Other St. Petersburg masterpieces by the architect include the Winter Palace (home to the famous Hermitage Museum) and the Catherine Palace in Tsarskoye Selo. The wooden izbas in the Chinese province of Heilongjiang , not far from the Russian-Chinese border, can be easily mixed up with buildings in the historical center of Irkutsk, beside Lake Baikal. One of the peculiarities of Irkutsk is the enormous number of wooden houses with no running water, central heating or plumbing. As an example, the city has its own wooden ‘country village’ next to the central market. A trip to the so-called 130th district in the center of the city is a must. This is where many of the city’s historical structures, such as merchant’s houses and other architectural monuments, have been preserved. Doesn’t this look like a typical Russian autumn, even though this old sugar house is in Vermont, USA ? Nowadays, autumn in European Russia lasts only a few weeks — it is a fleeting period of golden foliage, mustard-colored leaves rustling underfoot, crimson sunsets and chilly twilights. The so-called Indian summer is the best time to visit the summer country homes of Russian poets and writers, most of whom occupied their estates all year round.